Mirage has been entirely transformed over the last couple of years to create luxury designer interiors that make the most if it's stunning 270 degree views over Ibiza Town. This is the perfect designer villa for groups of friends or families with older children. The striking double-height staircase of Can Mirage leads up from the beautiful entrance to the stunning main living space which in turn connects seamlessly to the main terrace for perfect indoor-outdoor living! The stunning open plan living area has been cleverly divided into different areas by designer furniture. The main seating area has a state of the art entertainment system along with a fireplace (just incase you are not there during the height of the summer), large dining table and a separate bar perfect for those pre-clubbing cocktails. A few steps down from the bar is the indoor swimming pool with uber-cool lighting to provide the correct effect for every mood. The 5 bedrooms are all located on the lower floor and each individually decorated. All bedrooms have access to a terrace, plenty of storage and beautiful en-suite bathrooms. The attention to detail in Villa Mirage is second to none with such amenities as silent air conditioning for absolute relaxation and the best night's sleep possible. 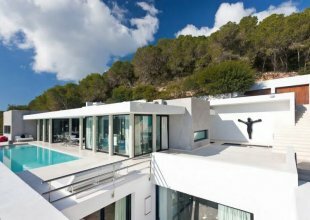 In Villa Mirage the outdoor areas are no less spectacular than the indoor spaces with two heated swimming pools, a Jacuzzi, barbecue area with an outdoor sound system and, numerous terraces. There is also a lush Mediterranean garden with mature tropical plants and lawn area.